In 2012, health reasons forced Cara Birkeland to re-assess her options and consider drastic changes. When she announced a decision to close the doors of Birkeland Bros Wool and focus on new horizons, Cara received an outpouring of wonderful and touching feedback... and an offer from one customer who could not stand to see the historic Birkeland Carding Machine retired. Karyn Waters was passionate about wool, and had grown up hearing stories from her father about his work running printing presses. Her husband had worked with his father running and maintaining antique candy making equipment. It felt like a magical opportunity to keep a proud family legacies alive for both Cara and Karyn. So how do you move a century old, two+ ton, belt-driven carding machine that's been sitting at the same location for more than 73 years? With care, patience, and lots of muscle. Over sunny weekends in March 2012 a team of carpenters, mechanics and volunteer lifters assembled to plan, disassemble and move the historic machine. A process successfully completed with only a few bruises, a sprained finger, a broken toe, and an undamaged carding machine. Wherever you start, you start with a tape measure in hand and a camera nearby. Everything was measured, and each part's position noted relative to those around it. To run smoothly the carding machine has required a lot of oil over the years, and that made labeling difficult; Duct tape was our labeling medium of choice, but parts had to be carefully cleaned in place to remove the accumulation of oil that otherwise made affixing labels impossible. Belts and smaller parts could now start being removed from the machine, and were each carefully packed with similar components. More than twenty, six foot carding rollers were removed from the machine and secured in a custom-built wooden frame for transport. 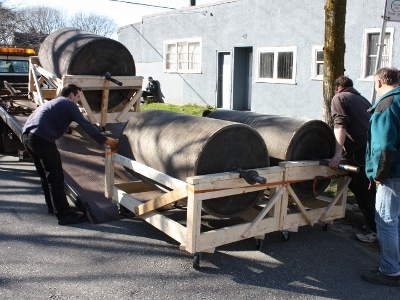 Many of these rollers weigh in excess of 150 pounds: with well-oiled shafts, they were a challenge for the team to carry down stairs, through the main doors and down the street to the truck. Covered in prickly metal carding cloth, they could not be dropped or even rested on the ground for even a moment. Each had to move from machine, to resting frame, to another frame in the back of the truck. Surprisingly, the small rollers proved heavier than the medium-sized pieces: they consisted of solid metal bars covered in heavy carding cloth. To transport the three large carding drums, custom reinforced carts were constructed on heavy-duty wheels. Braced in place, the large drums were carefully rolled on to the movable wooden frames. When the first cart began to tip under the incredible weight, everyone jumped on-board to act as human counter-weights until the drum was centered and secured in place. If one of the large carding drums fell, more than the carding cloth would be destroyed; in all likelihood the irreplaceable metal drum itself would shatter. This nail-biting process was repeated three times and ended with deserved celebration! 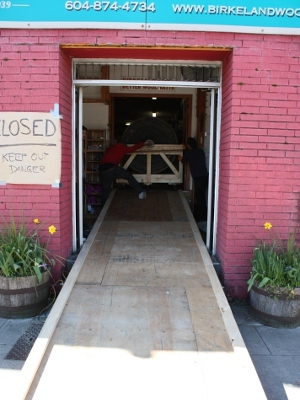 Made from 4x4s and heavy plywood, a long ramp was constructed to allow the heavy carding drums to be rolled down two flights of stairs and out the main entrance. A team of six used rope and tackle to lower each drum out to the street, while two others kept the interested bystanders at a safe distance. The ramp creaked and crackled but held: Main Street was safe from thousands of pounds of run-away metal drums wrapped in sharp carding cloth! An hour ahead of the setting sun, the three carding drums were winched and secured on the deck of a rollback truck, ready to move out to the valley. Over three weekends we were constantly amazed that despite the many closed signs, saw horses and construction materials, people kept stopping by asking to purchase wool. We had to sadly turn away so many customers! The work was far from done! To accommodate the carding machine in the new store, a huge platform had to be assembled to distribute the weight. Once the frame was in place, brackets had to be custom-made to fix it to the platform. One by one, the three carding drums on their reinforced carts were wheeled by hand (by many assistants) in to the shop and up six inches on to the platform. When fully assembled, seismic cabling was added to make sure nothing moves (nothing that isn't supposed to move, at least) and a wall constructed to protect the public from accidentally sticking their hands in to the carding machine. 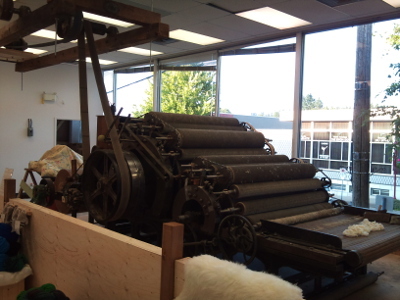 We are proud that we've been able to move the Birkeland Carding Machine out of a dark and cramped backroom in Vancouver to a bright and open showroom in Abbotsford's historic downtown. Come on in to see this working piece of history for yourself!